I know for ME, this post has been a long time coming! I have emailed everyone I could find at Facebook…no response. Searched the web high and low for answers…no luck. I just continued to persevere in my research and FINALLY found some answers that I think will help many of you. So how do you “authenticate” your page? and Why? For some reason, on some pages (and please, oh silent Facebook, if you want to enlighten me, please do), Facebook needs to make sure you’re the real deal before they will let you take certain actions (like merging your page with another duplicate page). This may be the case if you have a LOT of fans, or if you DON’T have a lot of fans (I know, no rhyme or reason! ), or the pages you’re trying to merge have different names. The good news is, it’s really easy to authenticate your page if you are, in fact, an official representative of your page! Where it says “Third Party Listing,” this just means they are looking for some external, 3rd party site that lists your organization in some way. Sort of an independent verifier. So if you’re an animal welfare organization, for example, you might put your Petfinder site URL, or your directory listing on Pet Harbor. You could also list the URL of your company’s page on your local Chamber of Commerce website, or a review site at a place like Yelp, Tripadvisor, Yahoo Local or Urban Spoon. Basically, they need to see a website listing information about your company (even just name and address will do) that is NOT created by you, that proves that you exist in some way and verifies your location. There is one other step here. You are required to list an official email address for the company so that you can receive a confirmation email. But it ALSO has to be an email address attached to YOUR personal Facebook account. So let’s go over what that means. When you set up your Facebook account, you have to have an email address. For me, it’s my personal email address. For most of us, we just have that one email address on our accounts. But you CAN add a lot more email addresses if you want. They encourage you to do that because (well, probably so they can send you emails) they want to have a backup email in case your main email becomes inaccessible. So the email address you provide here, in this authentication process, MUST be associated with your own Facebook account. So say you’re the volunteer with your organization who does Facebook, but your official email address for the organization is info@yourshelter.org. Well, you probably don’t have access to that account because it goes to a staff member, right? In that case, you will NOT be able to verify your account. Unless that “official” email is associated with your personal Facebook account, Facebook does not consider you an “official” representative of your organization or company. So in that case, you’ll have to do one of two things. You’ll have to get access to that account, at least temporarily, to add it to your personal Facebook account. If your organization won’t go for that, then you’ll have to have someone else do the authentication–and that person will have to add that email address to THEIR account! I know. Crazy and labor-intensive. But for MOST people, you ARE going to have access to that email address, because you ARE the official representative of your company or organization, so hopefully it won’t be such a hassle. If you try to put in an email address that is not associated with your Facebook account, it will give you an error message and will not let you proceed. That’s really all there is to it! You get a confirmation message asking you to wait up to one week for a response. When I did this on my pages, one took 2 days and one took 4 days. So that seems about right. Once your page is “Authentic,” then you can go about the business of merging other pages into it! Good luck. Please let me know if this worked for you or if you’re still hitting road blocks; I will do all I can to figure it out for us all! Still need help? Make an appointment with me for live, one-on-one troubleshooting! How to authenticate page for athletes? The process is the same for any type of page. You just need to have a “company name” which would be the athlete’s name, an address, phone number, etc. You probably wouldn’t have a company email address, so the athlete’s email address could be whatever his/her email happened to be. As long as you are the person authenticating–and that email address is associated with your account–it should work fine. Sorry you don’t have that link! I’ll post here, of course, if I discover anything else. You are still getting the “page must be authenticated” error message when you try to merge? If I put his number, which he uses, it is not good for his privacy. The same is for email….. Yes, still got the `page must be authenticated` message. Krn, nobody else sees this except for Facebook; it will never be public. If this person is a famous athlete, surely he has an agency number or something you can use instead of his personal phone number, email, etc. Johan, some people just don’t have the “protect your page” link. If that’s the case for you, then in THEORY, one of the other merging methods should work. But I realize sometimes they don’t work either. In this case, I would suggest submitting a bug report to Facebook here, but I’ll be honest–chances are they will not ever respond to you. I will always post any other information I find here, so stay tuned! Yes, other merging methods are discussed here. if you search a little on my blog you can find lots of other information, too! This method didnt work for athletes…..
My Resources tab doesn’t have a “Merge Duplicate Pages” option. And when I try the other method, I have the same problem as everyone else with the authenticity message. (And I don’t have the “Protect Your Page” button to take care of that.) Am I completely out of luck?? same problem here.. I don’t have/see the ‘Protect Your Page’ link and I can’t merge since both pages have similar, but not the same, names. Merging with methode #2 of your post also won’t work, since I need to authenticate a page. Nick–I know, it’s totally frustrating. If you don’t have any of the options, and you can’t authenticate, then your pages just probably are not eligible to be merged, unfortunately. My guess is it is because they don’t have the same name. If I come up with any other ideas, I will be sure to let you know! Kerry, It will be there anyway, even if you aren’t trying to merge. If you have the option, it’s a good idea to go ahead authenticate your page. That way if anyone tries to duplicate your page or spam it or anything else, you have proof that it’s “your” page if you ever needed to with Facebook. So I would go ahead and do it, if it will let you! That’s interesting, Umar–so you basically made your page a “place” page, and then it let you merge? If anyone else has had success with this method, I’d love to hear it. Let us know! Thanks for sharing, Umar! Hey Emily? Where do you find “Protect My Page” with the new Timeline? Can’t seem to find it? Where should it be? My page already had a map like Umar’s, and it’s not considered a place page, so I couldn’t authenticate that way, since I don’t have the “protect your page” option. I checked in to a place similar to my page’s name with the same address to create a place page. I then changed the name of that place to my fan page’s name. After several hours, under “resources” in the place page, I got a “claim” link for my fan page. 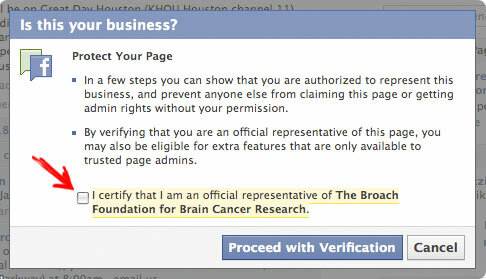 That gave me the popup to verify my page. I have entered the information and I ‘m waiting for the verification. I hope that it authenticates my page! That’s pretty awesome, Guillermo! I really hope that works for you–post back here and let us know, okay? If your band has its own website, like mybandname.com, you could certainly have an email address at that domain, couldn’t you? Even if this was the only thing you used it for. I would recommend setting up an email at your domain and using that to authenticate. Your articles have been so helpful! I am wondering, though, how you authenticate a FB page once you’ve switched it to Timeline? I don’t see the “Protect your Page” button anywhere. Help! Hi! Emily, thanks so much for your useful info!! Sorry for the ignorance but… how could I convert my page to a place to obtain the “protect your page” link? 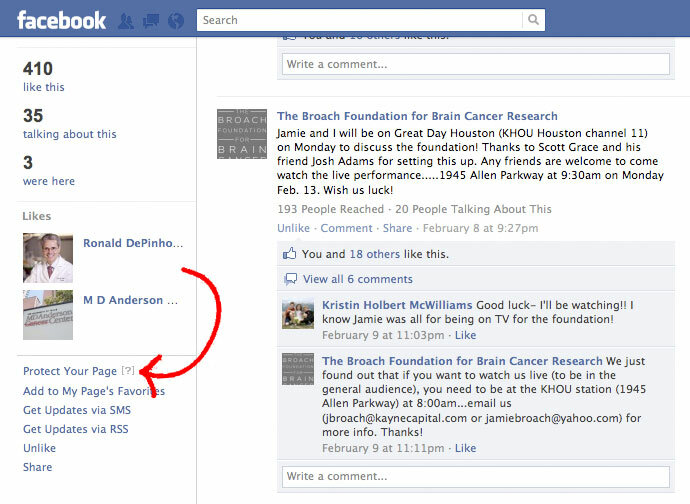 What you need to do is add an address to your page, under the “Basic Information” tab in the admin area. That makes it a “place.” That will sometimes give you the “protect my page” link…sometimes not. but it’s worth a shot! Good luck. Thanks sooo much Emily! I have added the address, but the link has not appeared… aggg!!! Will continue trying and reading your so useful tips! Regards! These posts have been extremely helpful, thank you so much Emily. I’ve tried about everything to get the “PROTECT MY PAGE” link to come up and still no dice. I have two pages, they are both places pages, one has 2,800 fans and the other is newly created, same names, same everything. I want to merge 2,800 fans into the new page. Man I wish I could get a facebook phone number! I added the address, but I still don’t have a “protect your page” link either. If you find out anything else PLEASE post it. You’re the only blog on the internet talking about this problem right now. Thanks, Warren. This continues to plague you and so many other people. I will definitely post if I figure this out, for sure! 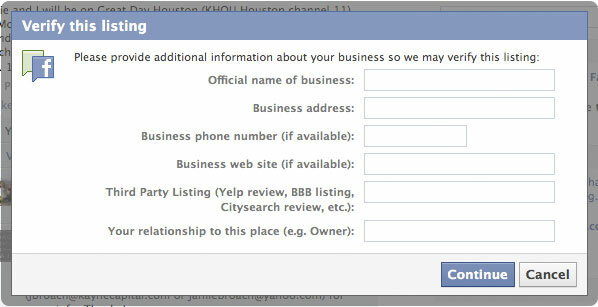 The protect your page shows up as long as you are logged into your personal page, then navigate to the business page. I was able to see it, followed the directions, and 1 day later, facebook confirmed the page protection. I have yet to see the merge option, but I am going to use Emily’s suggestions and link to see if I can merge the pages using the form function which is only available after you protect the page. @Justin Tanner, actually that doesn’t work for everybody. I’m an admin of about 2 dozen pages (mostly musicians), some with 200 fans and some with 20,000. Exactly zero of them give me the “protect my page” option, and none are authenticated. This is so aggravating – Emily, thanks for your attention to it! Maybe one of these days we’ll get an answer from Facebook.